You are welcome to re-publish an article by Elizabeth Yarnell as long as you complete the form at lower right when you select a piece of writing. The recipes included with the articles use a patented cooking method and may not be appropriated or altered in any way. Contact Elizabeth directly for permission to edit the article before publication. Please include the bio information and links at the end of each article to appropriately credit the author and inform Elizabeth where the article has been used. All articles copyrighted 2006, Pomegranate Consulting, LLC. One-pot meals can be the solution to quick and easy cooking when no one really has the time to cook… read more. Ask almost anyone who is in charge of putting the daily dinner on the table what the most dreaded chore is and you’ll likely hear a complaint about meal planning… read more. The start of the school year can indeed be a busy time for families, but it is possible to make healthy meals even with time constraints. It just takes a little know-how… read more. The dieter's rule of "eat less" should really be rephrased to "eat more fruits and vegetables! "… read more. Chronic disease sufferers typically receive detailed instructions regarding dosages of medication, but the conventional medical community is just starting to recognize the effects of diet on disease. For almost any type of ailment, choosing to practice a healthy diet can be an effective tool in any disease management strategy… read more. We’ve heard about saturated fats, unsaturated fats, and lately there’s been a lot of talk about trans-fats, but the messages can be confusing. It’s time to learn what all these fats mean and realize that all fats are not created equal… read more. The term “whole foods” has been thrown around so loosely that many people confuse it with “organic”. Make no mistake: these do not mean the same thing… read more. Penicillin and its derivatives account for up to 3/4 of the documented deaths from severe allergic reaction — anaphylaxis — in the U.S. These deaths occur mostly in people with no history of allergic reactions to penicillin, leading some scientists to believe that these unfortunate people may have been sensitized by eating meat or poultry from animals treated with antibiotics. Industrial meat producers are toying with human health, contaminating our environment, and torturing the animals we eat in order to turn a bigger profit…. Read more. 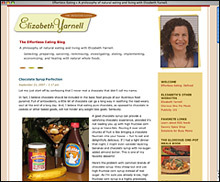 Read Effortless Eating, Elizabeth’s blog that shares a philosophy of selecting, preparing, savoring, reminiscing, investigating, dieting, implementing, economizing, and healing with whole foods so that healthy eating becomes an easy-to-follow way of life. While Elizabeth may be best known for her patented Glorious One-Pot Meals, she is an intrepid home chef who only cooks with the intention of eating well. According to Elizabeth, what’s the point of eating food that tastes bad or isn’t real? She believes that if you are trying to eat more healthily, it might as well be fun to do and taste great to beat. If healthy eating becomes so easy and convenient that it feels intuitive, well, so much the better. That’s called Effortless Eating. Choose Article What's for Dinner?... Send Kids Back to School... Eating for Weight Loss In Sickness / Health... All Fats... The Whole Story... What's in your hamburger?